It’s one of the most well-known and well-analyzed conversations in history: Our Lord’s interaction with Nicodemus. Their conversation centered on the central issue of salvation, how one could be reconciled to God. The Hebrew scholar was baffled by our Lord’s teaching that one must experience a second birth. To Nicodemus, this requirement seemed impossible. Still, as our Lord told Nicodemus, and as Angelina’s testimony below shows, with God nothing is impossible. It’s never too late to be born again. With the help of eight men from the church, carrying this dear sister in the Lord on a blanket, she gave faithful testimony of the Lord’s work in her life and was baptized. Angelina recently began attending Grace Christian Church, pastored by Luis Contreras and four other graduates of Word of Grace Bible Seminary (WGBS), The Master’s Academy International’s Member school in Mexico. 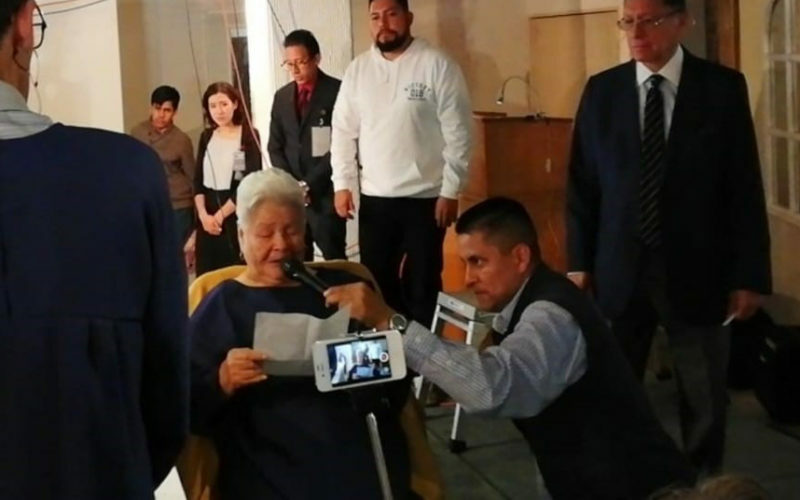 She’s 92 years old and, like many in Mexico City, she’s lived most of her life loosely following the teachings of the Roman Catholic church. However, after sitting under the faithful proclamation of the gospel, the Lord did a miraculous work in Angelina’s life—she was born again. Angelina’s story is in many ways the same as any believer’s testimony—one of God’s astounding grace in saving a lost sinner. She immediately desired to be obedient in baptism and she did not let her age or physical abilities hold her back from that desire. With the help of eight men from the church, carrying this dear sister in the Lord on a blanket, she gave faithful testimony of the Lord’s work in her life and was baptized. Her testimony has been transcribed and translated below. As you read, join us in praising the Lord for saving Angelina. Your support helps train pastors and church leaders like those who faithfully proclaimed the gospel to Angelina. That support is having a profound spiritual impact around the world. Please continue to pray for Angelina, Grace Christian Church, and Word of Grace Bible Seminary.